Undead! One of the great classics of fantasy monsters with a history that goes back to the earliest beginnings og culture. Could you even imagine a Sword & Sorcery world without any undead in it? They are probably a much more common representation of sorcery than sorcerers themselves. Yet I am finding myself beginning to seriously doubt my concept for undead in the Ancient Lands setting. The problem begins with the basic assumption that for mortal creatures body and soul are an inseparable whole, from which follows that people do not face troubles with the certainty that a better life awaits them after death. This really is one of the core premises of the whole setting that forms part of the basis of its many cultures and religions. This is something that just can’t go. But I still love undead and so reduced them to half a dozen forms that are mostly mutations caused by sorcerous energy (ghouls, wights) or or elemental-like entities that have some faint resemblance to the people from which they were created (shadows, wraiths) But the downside is that you can’t really have conversations with the actual dead. 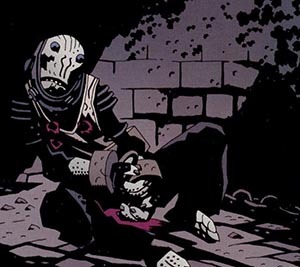 Hellboy has a lot of scenes where he discovers old battlefield and the frozen skeletons whisper warnings and advice to him. That’s an element that is just so cool and I don’t really want to have missing out on it. And sometimes they aren’t even human. But the problem gets even bigger. The Ancient Lands are a very nontraditional setting while zombies, ghouls, wights, and wraiths are all as generic Standard Fantasy as orcs and goblins. Now that I’ve started looking again over towards Final Fantasy, Star Wars or Kalimdor from Warcraft 3 as stylistic inspirations and references they’ve started to stand out to me as somewhat out of place. 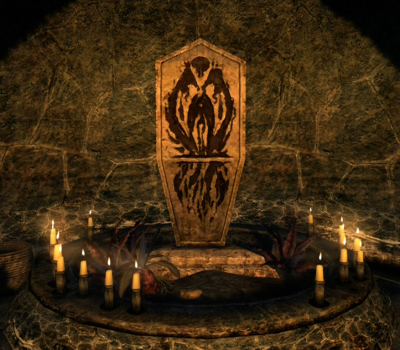 Morrowind has lots of undead but those exist within a context of a complex culture of worshipping dead ancestors. Can’t worship your ancestors if they’ve ceased to exist. What am I going to do with unbdead that really makes them seem like an integrated part of the setting instead of something foreign clumsily tacked on? No afterlife has to remain integral to the religion and cosmology of the Ancient Lands. Removing the spirit of a mortal (and putting it somewhere else) also must remain an impossibility. But there is still the Spiritworld. The limitation that spirits have to be tied to the body applies only to mortals, such as people and animals. For spirits this is not the case and they can manifest physical shapes separate from their actual “bodies” (mountains, lakes, trees, …) and possess the bodies of mortals. In Final Fantasy X, there are the fayth, great mystics of ancient times who have somehow preserved their bodies in an eternal sleep within sacred shrines and gained the ability to create powerful spiritual phantoms that can aid living summoners in battle. I really quite like that concept. Putting great shamans into an eternal sleep between life and death to become something similar to spirits that can advise the living in times of need would be pretty cool. And it could also be extended to undead. 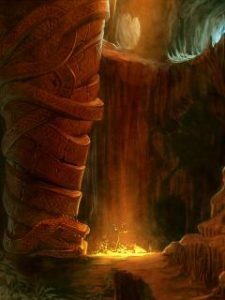 Instead of people simply dying in places of great sorcerous power, they could become part of the place. Their bodies may be dead, but the energies of the place keep their spirits together to at least give them some ability to communicate with living visitors through visions. It would also mean that they can never leave the place, which is not just an interesting image but also keeps them neatly confined and unable to spread across the world. For simple animated corpses an exception could easily be made. They would be mindless and only be moving on magic strings created by a sorcerer. Scary, but not really returning from death. The bodies move again, but this time there is no spirit inside For ghouls I think the idea of sorcerous mutants that are technically still alive, just really sick and unnaturally strong, could still work really well. That would only really leave the wight, which I had already fused with the mummy and the lich, I think those are all really different expressions of the same idea, I could simply scrap them and leave it at that, but perhaps I could also find a different background and role for them that would fit better into the setting. Previous Previous post: Or an AL-Series perhaps? Next Next post: Heroic Fantasy Handbook and Barbarian Conquerors of Kanahu for ACKS.